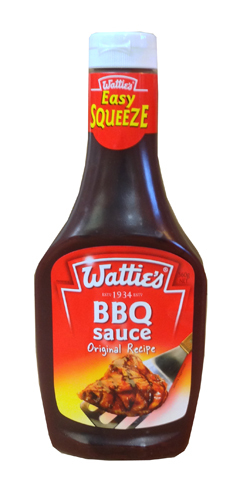 This classic Watties BBQ sauce is a tasty, smoky complement to all your barbecue staples: your sausages, your burger patties, your veggie skewers. Its Upside Down bottle design makes for easy access, and does away with your other barbecue staples: your centrifugal armswinging and your back of the bottle palm whacking. It also contains no artificial flavours or preservatives, and is 99% fat free. Concentrated Tomatoes, Sugar, Salt, Food Acids (Acetic Acid, Citric Acid), Colour (Caramel III) Flavours 9including garlic), Vegetable Gum (E415), Spices, Smoke Flavour.